Just seeing those two words next to each other will cause the hearts of most hockey fans to start racing -- for good reason. The intensity and physicality of the postseason is heightened by the finality provided by sudden-death overtime. With one masterful stroke, one flash of brilliance, any player can turn himself into a hockey legend. Though some of the greatest players in League history have scored series-winning goals in the Stanley Cup Playoffs, more than a few players of relative anonymity have stepped up and earned a place in the spotlight almost instantaneously. On April 24, 1993, one such player -- with a little help from a legendary announcer -- etched his name into NHL lore by scoring one of the most unlikely goals in its long postseason history. The 1992-93 Sabres were a wildly entertaining team. 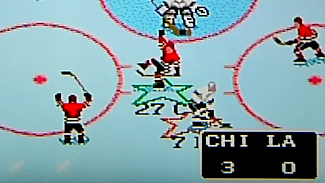 Their attack was led by Pat LaFontaine (53 goals, 95 assists) and Alexander Mogilny (76 goals, 51 assists). They also possessed an exceptional goaltending tandem of Grant Fuhr and a young Dominik Hasek. Finally, the Sabres employed a number of players who were not afraid to drop the gloves, including Gord Donnelly, Bob Sweeney and Rob Ray. But the team leader in penalty minutes that season was a 21-year-old Toronto native named Brad May. "That was my second year in the NHL, and I was lucky to play with some incredible talent," May told NHL.com. "We had such a great make-up of guys. I loved playing in Buffalo and my teammates were awesome. After [Dave] Andreychuk got traded, I got to play on the line with Lafontaine and Mogilny for the better part of the second half of the season, and I was just really excited to play alongside such great players. Every day that I'd lace them up was a great experience, being such a young guy." For all the firepower the Sabres possessed, though, they were at times wildly inconsistent. They lost their final seven regular-season games to wind up fourth in their division, which earned them a first-round playoff series against the powerful Boston Bruins. Despite the fearsome opponent and the fact the Sabres had not won a first-round series in a decade, they remained confident they could stifle Bruins star defenseman Ray Bourque and defeat their division rivals. "You want to be playing well heading into the playoffs, which we weren't," Sweeney said. "But we were prepared for the Bruins. [Sabres coach] John Muckler did a fantastic job. I can remember his game plan, and it worked to a T against the Bruins." "The Boston offense was built around Ray Bourque running it," former Sabres general manager Gerry Meehan said. "I remember the amount of commitment that guys like Brad May made to neutralizing Bourque. I think our team did an excellent job of neutralizing him." Sure enough, May and the Sabres shut down Bourque and quickly jumped out to a 3-0 series lead. And as Game 4 settled into overtime in front of a sellout crowd at the old Buffalo Memorial Auditorium, May and Bourque would cross paths one last time. At 4:44 of the extra period, with the scored tied 5-5, LaFontaine -- who had scored a famous series-clinching goal for the New York Islanders six years earlier -- was skating through the neutral zone when he was knocked down. While lying on the ice, he pushed the puck forward, where May picked it up at the blue line. Then, in one quick motion, May deftly tapped the puck between the skates of an onrushing Bourque and skated in alone on net, where he drew goaltender Andy Moog out of position before firing home the winning goal, sending the crowd at the Aud into a frenzy. Rick Jeanneret's "May Day" call will always have a connection with Sabres fans. The Buffalo Sabres asked their Twitter followers if they remembered where they were when May scored. May's spectacular move stunned Bourque and the Bruins, and it certainly left a few of his teammates speechless. "I had a front-row seat," LaFontaine said. "I see it's Brad May, and then he makes an inside-outside move on Ray Bourque. I had to do a double-take and make sure it was No. 27. "[May] is such a great guy and had a tremendous career, but you don't expect guys who are deemed more power forwards, in a sense, to make moves like that. He wasn't that kind of finesse player, so to make a move like that against a Hall of Famer like Bourque and Moog … it was special." "Then panic set in," May said, joking, "because I saw the whole bench come at me and basically try to put their stinky gloves in my faces, so I raced to the other end of the ice to get away. It was so amazing to be a part of that, obviously to have that as an individual moment, but also to win in Buffalo with that team was so fun." "Lafontaine tripped up, he gets it to May. … In over the line. … Here's May going in on goal! He shoots … HE SCORES!! MAY DAY! MAY DAY! MAY DAY! MAY DAY! MAY DAY! BRAD MAY WINS IT IN OVERTIME!" "It was completely spontaneous," Jeanneret told NHL.com. "I don't think he'd scored in 15 or 16 games, it was a long time. He would've been the last guy, I guess I'm trying to say, that I thought would score the overtime goal and send the Sabres to the second round of the playoffs. No, no, that just tumbled out of me, and I started it and I didn't know how to stop it. I just kept saying ‘May Day!' until I could think of something else to say." Having started with the Sabres as a radio personality during the 1971-72 season, Jeanneret had developed a reputation for his playful demeanor and his passionate, energetic calls, such as "La-la-la-la-LaFontaine!" and "Top shelf where mama hides the cookies!" His longevity and continued enthusiasm eventually led to him receiving the Foster Hewitt Memorial Award for excellence in broadcasting from the Hockey Hall of Fame in 2012. For most Sabres fans, it's that call he made 20 years ago that remains his enduring legacy. "I still see it to this day," Jeanneret said. "It gets a lot of hits on YouTube, things like that. It's one of the highlights -- there are several others as well -- but ‘May Day' would be right up there near the top." "When I did an interview 20 minutes after the game, that was the first time I had heard it," he said. "It was so amazing, obviously, just the way it sounded in the whole place. Jeanneret is such an amazing guy, and such an amazing broadcaster. I was there the night they inducted him into the Hall of Fame, and they played his video, and it included that call. So just being aligned with Rick Jeanneret through that whole experience was just amazing." All of the jubilation created by May's goal and Jeanneret's call, however, was short-lived. 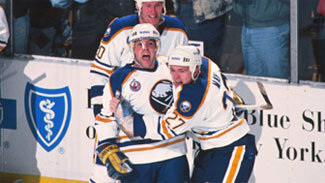 Injuries to LaFontaine and Mogilny crippled the Sabres' attack in the second round, and despite a valiant effort, the Sabres were swept by the eventual Stanley Cup champion Montreal Canadiens, with the final three losses coming, ironically enough, in overtime. Many of the players on that Sabres team never lifted the Cup. May had to wait 14 seasons before finally winning it in 2007 as a member of the Anaheim Ducks. He retired in 2010 and works as an analyst for Rogers Sportsnet. He also participates in the instructional series "Hockey Skills presented by Canadian Tire," which appears regularly on NHL.com. Jeanneret just completed his 42nd season calling Sabres games and is working alongside May's former teammate Rob Ray announcing games for the MSG Network. Some players, especially those who have played in more than 1,000 games and earned a Stanley Cup ring, might take issue with being known for one moment of their career. May, however, eventually embraced his hockey legacy: He earned the nickname "May Day" as a result of his goal, and visitors to May's website are immediately greeted with the audio of Jeanneret's call. "I think the one thing is, you didn't want to be remembered for something that happened in 1993 when you're still playing hockey in 2003, you wanted to make more memories," May said. "I didn't rest on my laurels by any means, but it definitely stayed with me. When I got introduced at different events, people would recall that goal and that call by Rick. It's been awesome, and I'd be lying if I said that I didn't enjoy it. It's been a big part of who I am today and who I was as a hockey player. It's one of those moments that not all of us get, and I feel honored that I had that experience."